엔토 매니저님! Ever 선생님은 어떤 분이신가요? 10년이 넘는 ESL 티칭경력으로 내공이 장난이 아니에요. Ever 선생님은 엄마같이 포근한 스타일로 학생들을 이끌어주십니다. 영어회화에 자신감이 없어도 괜찮아요! 선생님의 부드러운 대화 진행에 흠뻑 빠져보세요. 자연스럽게 영어로 말하게 되실 거에요. Hello everyone! My name is Ever and you can call me Teacher Ever. 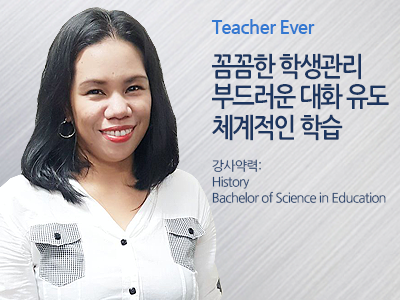 I’ve been teaching for almost 10 years, and my experience in this industry will prove to you that I am dedicated, hardworking, assertive, and efficient teacher. 저는 10년 정도 가르쳐왔고, 이 분야에서 저의 경험은 제가 얼마나 헌신적이고 열심이 있으며, 유능한 선생님이라는 것을 증명해 줄 것입니다. In the span of my career, I’ve taught in a physical set-up, done online video classes and group classes catering to Koreans and the Japanese. 저의 경력에 비추어 볼 때, 저는 한국인과 일본인을 대상으로 비디오 수업과 그룹 수업으로 학생들을 가르쳤습니다. I treat my students as my own children. 저는 저의 학생들을 저의 자녀처럼 대합니다. Seeing my students improving and learning is my reward as the teacher. 나의 학생들의 진보된 영어와 배우고자 하는 마음을 보는 것이 저에게 있어, 선생님으로써 보상입니다. One of my strengths is making my class fun, lively and active, because I believe that when your heart is happy doing something, you can endure any challenges and difficulties along the way. 저의 강점 중 하나는 즐겁고, 역동적이며 활기찬 수업을 만드는 것입니다. 왜냐하면 저는 여러분들의 마음이 무엇인가 하는 것을 행복하게 느끼면, 어떠한 어려움이나 도전을 견딜 수 있다고 믿기 때문입니다. So please allow me to be part of your journey as you learn English as a second language. 영어를 제2의 언어로 배울 때, 저를 여러분의 여행 동반자로 생각해주세요. Maximizing your potential, training you to be independent and competent are my aims for you. Once again, I’m Teacher Ever. 잠재력을 극대화 하고, 독립적이며 유능한 사람이 되도록 훈련시키는 것이 저의 목표입니다. 다시 한 번 말씀드리지만, 저는 에버 선생님입니다. I hope to see you in my class and let’s learn in a fun and exciting way. 나는 여러분이 저의 수업에서 흥미 진진한 방법으로 배우기를 바랍니다.